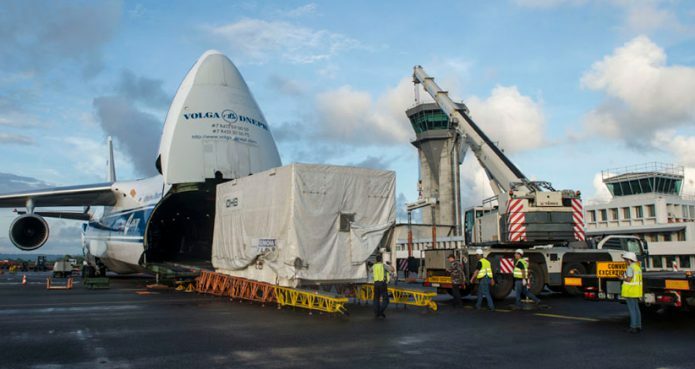 Hispasat 36W-1 is readied for its transfer by road to the Spaceport after arriving at Félix Eboué International Airport. Launch preparation activity is underway for Arianespace’s initial mission in 2017, with an all-new type of telecommunications satellite now delivered to the Spaceport for liftoff on a Soyuz launcher from French Guiana in January. Arriving aboard a chartered Antonov An-124 cargo jetliner was Hispasat 36W-1, the first satellite based on the SmallGEO platform developed under the European Space Agency’s Advanced Research in Telecommunications Systems (ARTES) program. The aircraft touched down earlier this month at Félix Eboué International Airport near French Guiana’s capital city of Cayenne. The spacecraft was unloaded and transferred by road to the Spaceport launch base, where it is undergoing initial checkout in the S1B payload preparation facility. Once orbited by Arianespace, Hispasat 36W-1 will be operated by Hispasat – a world leader in Spanish and Portuguese broadcasting. 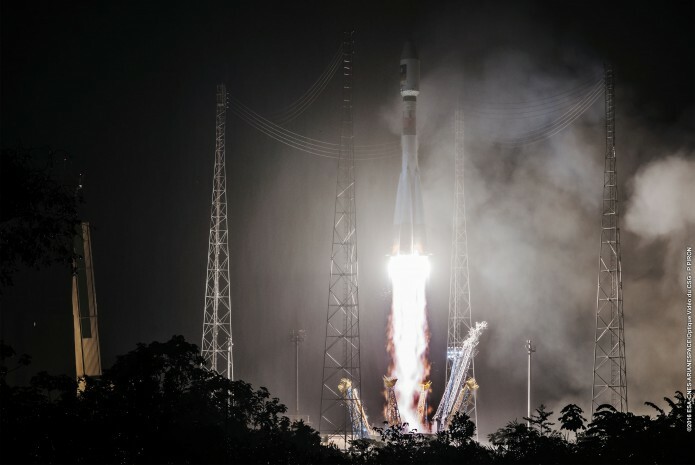 Germany’s OHB System AG designed and built the three-metric-ton Hispasat 36W-1, and its delivery to French Guiana marked the completion of a nearly eight-year development effort for the SmallGEO platform. Hispasat 36W-1 is equipped with a conventional commercial relay payload of 20 Ku-band transponders, along with three Ka-band transponders developed by TESAT Spacecom under funding from the DLR German Aerospace Center. Also integrated on the satellite is a new-generation active antenna that receives and reconfigures radio frequency beams over the Earth’s visible disc. This Redsat payload and its onboard processor will enable Hispasat to provide more flexible multimedia and broadcasting services over the Americas, Europe and the Canary Islands.